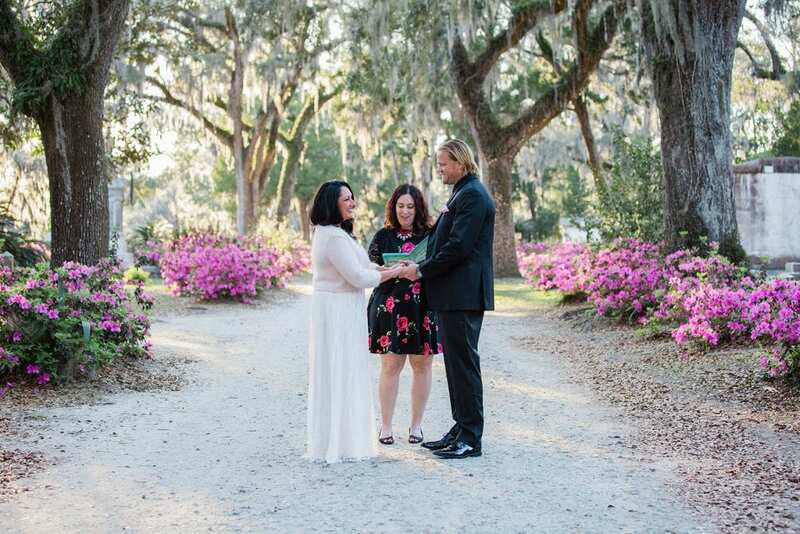 Let Me Help You With Your Savannah Wedding or Elopement! Hey there! I really want to hear from you with any questions you have about Savannah Custom Weddings & Elopements and help you book your service with me. Before completing the contact form, I encourage you to review my Ceremony Package options. If you are inquiring about booking a Simple Signing Service, fill out the form on this page to receive the link to our self scheduling calendar. The fastest way to get in touch with me is this email form, but here are a few other ways to contact me, too. Phone: (912) 226-4097 Because of the volume of calls we receive about Signing Services and marriage licenses, we use a pre-recorded outgoing message for all calls. Please use the menu options to leave a voice mail for our team. You can also text us if you have a quick question. Based on the volume of inquiries I receive, my Scheduling Manager & Client Concierge, Shannon, answers all of our initial inquiries, including those that go to my email address. She will identify herself and sign the email with her name. Fill out this contact form with your question, request or feedback and someone will get back to you as soon as possible.